I have mentioned in my tutorials that I exclusively use Bullseye Glass. I’ve been asked why, and I thought it was important to discuss this. Your choice of glass is probably the most important decision you will make as a kilnformer. It is your medium. Yes, the kiln, the glass cutter, your coldworking tools are important, but the glass is the thing you’re working on. 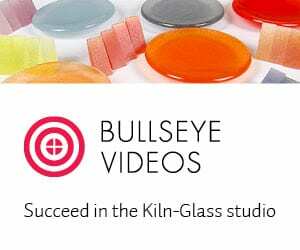 I have not had extensive experience with all the various fusible glasses that are now available, so I will not comment on the relative merits or demerits of the other types of fusible glass available – but rather why I use Bullseye glass. It is possible to have several different brands of glass in your studio at the same time. But, as you become more and more immersed in this artform you will find that there are innumerable reasons for projects to fail. Accidentally mixing incompatible glasses is one of those reasons. This potential problem is best avoided by never having incompatible sheets of glass in the studio at the same time. Bullseye has a huge selection of colors in sheet glass, as well as accessory glasses. There are types of glass that at first glance seem that they would be compatible with one another — the most obvious of this is Uroboros 90 COE and Bullseye glass. And they probably are compatible… most of the time. But, one should still use caution when mixing these different brands of glass. 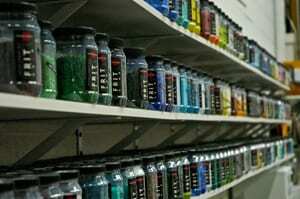 Bullseye glass is guaranteed compatible only with Bullseye fusible glass. Not with other brands of COE90 glass, and not even with sheets of Bullseye non-fusible glass. There is more to compatibility than just COE. By Murphy’s Law an issue will come up at the least opportune time. 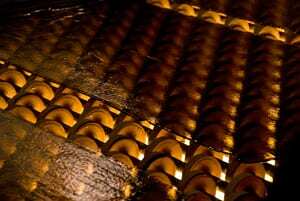 Sheets of amber glass rolling down the assembly line to the annealer at the Bullseye factory. Also, Bullseye glass is guaranteed to maintain its compatibilty through three full fuse firings. A full fuse firing is considered to be 1500F. The huge numbers of colors available. The availability of single rolled, double rolled, regular and thin sheets, as well as iridized in many, many colors. The consistent appearance of new colors and types of glass. The large range of accessory glasses available (eg, frit, stringer, confetti), as well as rods, cullet, and billets. The particular beauty, sophistication, and harmony of their colors. The technical support provided by Bullseye in the form of classes, conferences, printed technical bulletins, and response to individual questions. 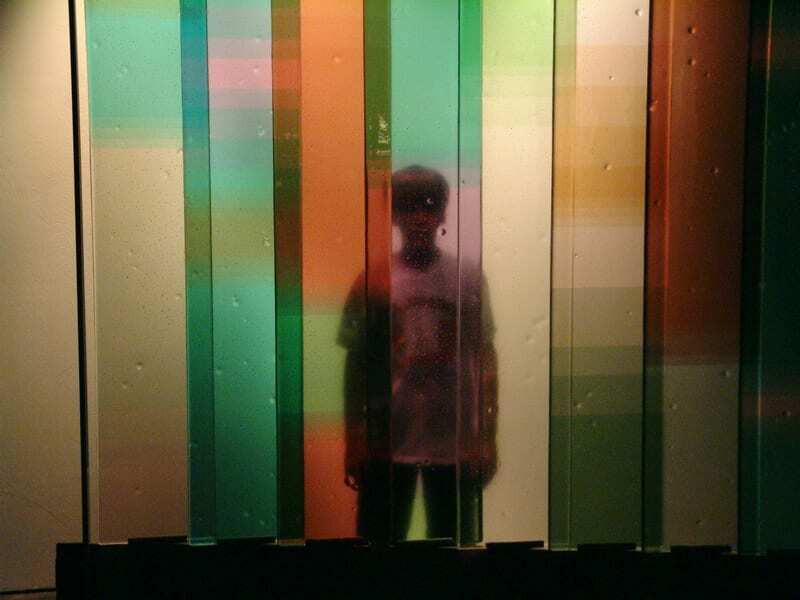 The company’s support for glass artists in the form of conferences, artist in residence programs, competitions, shows, publications, and their gallery in Portland. They have resource centers for classes and the purchasing of materials in Portland, Santa Fe, Mamaroneck, NY, and the Bay Area in California. The fact that I have had only one compatibility problem since 1995 – and that was a pink and cranberry issue – colors I rearely use. Every tenth sheet off the line is tested against a reference glass for compatibility. With proper firing schedules, devit can be completely avoided, or at least kept to a minimum.The company stands by their products, and if there are problems they appropriately address them. The fact that I can push the glass well beyond it’s stated temperature range, with minimal problems. The fact that they sell direct and through distributors, but give volume discounts when they sell direct. Remember: Bullseye invented the concept of compatible fusible glass.